In this lesson, we will learn how to use the work–energy principle to solve problems involving a moving particle under the action of a constant force. A body of mass 15 kg fell from a height of 15 m above the ground. Using the work-energy principle, find its kinetic energy just before it hit the ground. Consider the acceleration due to gravity to be 9.8 m/s2 . A ring of mass 1.5 kg was sliding down a vertical pole. Starting from rest, it accelerated over a distance of 3.3 m until its speed became 6.2 m/s. Using the work-energy principle, determine the work done by the resistance to the ring’s motion. Take 𝑔 = 9 . 8 / m s 2 . Two bullets of equal mass were fired at the same speed into the opposite sides of a target. The target was formed of two different pieces of metal stuck together. The first was 10 cm thick, and the second was 14 cm thick. When the bullets hit the target, the first one passed through the first layer and embedded 8 cm into the second before it stopped, whereas the other bullet passed through the second layer and embedded 5 cm into the first layer before it stopped. Using the work-energy principle, calculate the ratio 𝑅 𝑅 1 2 , where 𝑅 1 is the resistance of the first metallic layer, and 𝑅 2 is that of the second. The coordinates of the points 𝐴 and 𝐵 are ( − 8 , − 8 ) and ( 9 , − 3 ) . A body of unit mass moved from 𝐴 to 𝐵 in the direction of  𝐴 𝐵 under the action of the force F , where F i j = ( 6 + 7 ) force units. Given that the body started moving from rest, use the work-energy principle to find its kinetic energy at point 𝐵 . A body of mass 4 kg is projected at 3.3 m/s up the line of greatest slope of a smooth inclined plane. Using the work-energy principle, find the work done by the body’s weight from the start of its motion until it came to a momentary rest. A particle of mass 100 g was projected vertically upwards at 20 m/s from a point on the ground. Use the work-energy principle to calculate its kinetic energy when it was at a height of 14 m above the ground. Take 𝑔 = 9 . 8 / m s 2 . A car of mass 920 kg was moving along a horizontal section of road. The driver applied brakes when it was travelling at 54 km/h. Given that it came to a stop after covering a distance of 30 m, find the work done by the brakes over this distance. The driver of a car of mass 1 056 kg was approaching some traffic lights at 14 m/s. The lights turned red so he started braking to bring the car to a stop. The brakes applied a constant force of 128 kg-wt. Using the work-energy principle, determine the distance covered by the car until it came to rest. Consider the acceleration due to gravity to be 9 . 8 / m s 2 . A body was at rest on a rough horizontal plane. A force of 10 kg-wt acted on the body causing its kinetic energy to increase to 57 kg-wt⋅m over a distance of 12 m. Using the work-energy principle, find the resistance of the plane to the body’s motion. Consider the acceleration due to gravity to be 9.8 m/s2. A body of mass 15 kg started moving horizontally from a position of rest in a straight line under the action of a horizontal force of magnitude 250 g-wt. 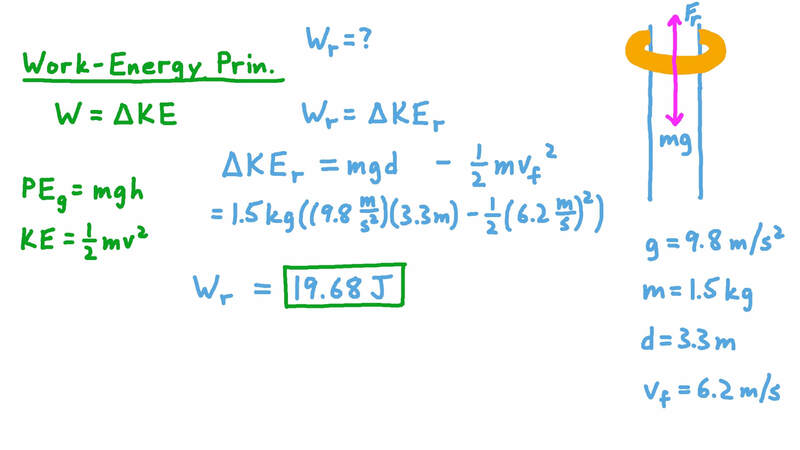 Given that it covered a distance of 6 m, use the work-energy principle to find its final speed. Take 𝑔 = 9 . 8 / m s 2 . A body of mass 96 kg was moving in a straight line at 17 m/s. A force started acting on it in the opposite direction to its motion. As a result, over the next 96 m, its speed decreased to 11 m/s. Using the work-energy principle, determine the magnitude of the force. A particle of mass 8 kg was left to descend along the line of greatest slope of a smooth plane inclined at 3 0 ∘ to the horizontal. Using the work-energy principle, find the speed of the particle after it had moved a distance of 27 m down the slope, rounding your answer to two decimal places. Take 𝑔 = 9 . 8 / m s 2 . A body of mass 300 g was placed 2 m up on a rough inclined plane. It slides down the plane from rest, reaching the ground with a speed of 156 m/min. Taking 𝑔 = 9 . 8 / m s 2 , find the work done by the body’s weight against friction. A body of mass 550 g was placed at the top of an inclined plane of height 1.5 m. Find the velocity of the body when it reached the bottom of the plane given that the work done by the resistance of the plane against the motion was 1.59 joules. Take . A body of mass 400 g was placed at the top of an inclined plane of height 8.5 m. It descended the plane, and when it reached the bottom, its speed was 10 m/s. Using the work-energy principle, determine the magnitude of the work done by the resistance, given that it was constant throughout the movement. Take 𝑔 = 9 . 8 / m s 2 . A body started moving from rest from the top of a ramp that is 312 cm long which was inclined at 6 0 ∘ to the horizontal. When it reached the bottom, it continued moving on a horizontal plane. The resistance to the body’s motion is constant on both the ramp and the plane and equal to √ 3 4 times the weight of the body. Determine the distance that the body covered on the horizontal plane until it came to rest. A body of mass 70 kg was moving under the action of a force of 8 kg-wt acting parallel to its motion. After the body had moved under the action of the force for a distance of 200 cm, its kinetic energy became 1 851.5 million ergs. Using the work-energy principle, determine the speed of the body before the force started acting on it. Take 𝑔 = 9 . 8 / m s 2 . A bullet of mass 35 g was fired at 800 m/s towards a thick barrier. The bullet penetrated 70 cm into the barrier before it came to rest. Determine the magnitude of the resistance of the barrier to the motion of the bullet given that it was constant throughout the motion. A bullet of mass 57 g was moving at 224 m/s towards a thick wooden wall that was coated in a layer of rubber which was 4 cm thick. The bullet passed through the rubber, and then embedded 6 cm into the wood before it stopped. If the resistance of the wood to the bullets motion was constant and twice the resistance of the rubber, using the principle of work and energy, determine the resistance of the rubber 𝑅 1 and that of the wood 𝑅 2 . Take 𝑔 = 9 . 8 / m s 2 . A bullet was fired horizontally at 500 m/s towards a piece of wood. It hit the piece of wood and penetrated 20 cm deep before it stopped. If a similar bullet was fired at a similar target made of the same kind of wood but of thickness 11 cm, determine the speed at which it would exit the back of the target. A bullet was fired horizontally at 900 m/s towards a thick piece of wood. The bullet struck the piece of wood and penetrated 9 cm deep before it stopped. If a similar bullet was fired at a similar target made of the same kind of wood but of thickness 6 cm, determine the minimum speed at which it needs to be fired to pass all the way through the target stating your answer to two decimal places. A truck of mass 1.8 tonnes started moving from rest along a horizontal road against a resistance of 14 kg-wt per tonne of its mass. After covering a distance of 250 m, its speed became 42 km/h. Using the work-energy principle, determine the force generated by the truck’s engine. Take 𝑔 = 9 . 8 / m s 2 . A mechanical hammer of mass 0.9 tonnes fell vertically from a height of 3.6 m onto a pole of mass 450 kg. The hammer and the pole moved as one body penetrating 10 cm into the ground. Using the work-energy principle, find the resistance of the ground to the motion of the pole in kg-wt. Take 𝑔 = 9 . 8 / m s 2 . A cyclist was riding his bike along a straight horizontal road. After he had cycled 410 m under his own strength, the combined kinetic energy of the cyclist and his bike was 1 763 kg-wt⋅m. Then he stopped peddling. After the bike had covered another 240 m, the kinetic energy dropped to 827 kg-wt⋅m. Using the work-energy principle, determine the force 𝐹 generated by the cyclist and the resistance 𝑅 to the motion, assuming that both were constant. Take 𝑔 = 9 . 8 / m s 2 .